Professional Wireless Communications offers comprehensive coverage for large-scale hospitality venues such as hotels, resorts and casinos. PWC understands the need for such venues to have multiple lines of communication for staffs that number in the hundreds and have people working 24 hours a day, seven days a week. With PWC’s digital two-way radios, you can have the interoperability you need with dedicated lines for maintenance, security, housekeeping, administration, etc. while still having the ability to reach everyone with the push of a button in case of emergencies. At PWC we’re experts in two-way radio and dispatch communications, so we understand that hotels, casinos, resorts, arenas, etc. all have the need for not only wide-area communication, but all have their own specific, unique needs depending on the operation. PWC will work with you in a consultative fashion to best address all of your communications needs. Large-scale hospitality operations need radios that offer multiple lines with interoperability between them. Maintenance, security, and housekeeping jobs all need to have dedicated lines of communication with the ability to also be able to talk to each other – as well as front desks, administration and other units. PWC works with a variety of hospitality businesses, so we custom design every system to suit whatever your specific communications needs might be. The benefit of two-way digital radio is that PWC provides a much more comprehensive communications system for hospitality operations that need multiple lines of communication open and available 24 hours a day, seven days a week. You have different crews that all need their own lines of communication, but also need the ability to reach each other if the need arises. Two-way radios are easy to use and give you the ability to separate your communication lines in as many ways as you need to. We understand that most businesses in hospitality markets are constantly using their two-way radios and your in-house communications are entirely dependent on them. With all that use, you need a service provider that you can count on. At PWC, we pride ourselves on our customer service and our attention to detail. Servicing radios and providing complete customer satisfaction is a huge part of why we’re the best communications company in the area. We don’t recommend just one radio for the hospitality industry, as there are too many different needs and requirements depending on the operation. Our service begins with a consultation period where we assess your needs and come up with the best solution for you. If you’re a smaller concert venue, the Hytera PD3i series might be exactly what you’re looking for. 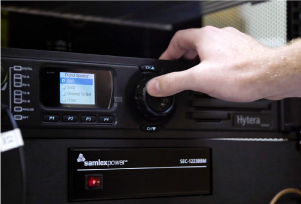 Conversely, the Hytera PD6i gives casinos the flexibility and features they need. 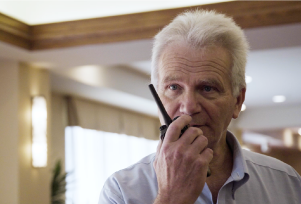 PWC’s experts will find the perfect two-way radios to fit your communication system needs.